Urban Meyer is an elite American college football coach and has been serving as the Ohio State Buckeyes head coach since 2012. This was after enjoying stints at Florida, Utah, and Bowling Green. The former college athlete played as a defensive back at the University of Cincinnati. He is a three-time national championship winner as a coach, making him one of only three people to have managed to win titles with different universities. Meyer was born Urban Frank Meyer III to Bud and Gisela Meyer on the 10th of July, 1964 in Toledo, Ohio but was raised in Ashtabula, Ohio, where he attended Saint John High School. After impressing as a high school baseball player, Meyer upon graduation in 1982, was selected as a shortstop by the Atlanta Braves in the 13th round of the 1982 Major League Baseball Draft. Urban Meyer played for the Braves as he concurrently attended the University of Cincinnati where he also had a college football career, playing the defensive back position. His time in baseball lasted for two seasons as he decided to fully focus on completing his education. By 1986, Meyer graduated with a degree in psychology before later going on to acquire a master’s from Ohio State in sports administration. Following the end of his college football career, Meyer interned as a defensive back coach at Saint Xavier High School in Cincinnati, Ohio. After one season, he took the position of graduate assistant coach for tight ends at Ohio State University. He lasted two years in the job before first moving to Illinois State where he was promoted to assistant coach. Meyer spent two years there before spending six years at Colorado State and then five years at Notre Dame. In 2001, Urban Meyer landed his first head coach role at Bowling Green State University. He proved to be a sensation in his new role as he guided his team to an 8-3 record to earn the Mid-American Conference coach of the year award. The following year, his team managed a 9-3 record and Meyer himself became the subject of interest from various schools. He ended up moving to the University of Utah where he again proved his mettle by guiding the school to a 10–2 record to win the championship as he was also named the Mountain West Conference Coach of the Year among others awards. Meyer won another championship in the following year. This time, he did it with a perfect 12-0 record. Urban Meyer became somewhat of a wanted man after that year as both Florida and Notre Dame fought for his services. He went on to join Florida where in his second season in charge, he won the SEC East title, the SEC Championship, and the BCS National Championship. The team repeated the feat in 2008 to cement Meyer as a legendary coach. In 2009, Meyer took a leave of absence in order to attend to his health. His contract later ran out without him agreeing to a new deal, giving room for him to take the head coach job at Ohio State in 2012. 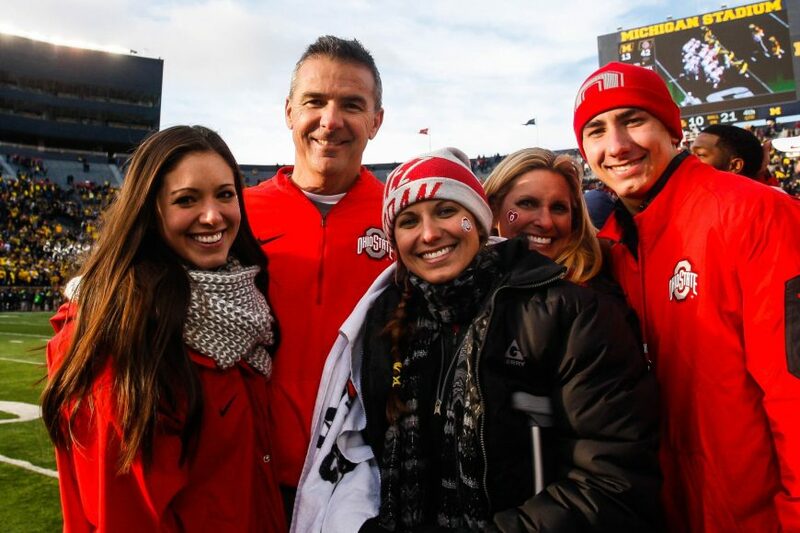 Urban Meyer is married to the beautiful Shelley Mather Meyer – a registered nurse and a certified spinning instructor. Mrs. Meyer was born Shelley Jean Mather on the 25th of December 1964, on her family’s farm in Lattaville, Ohio. She attended the University of Cincinnati where she studied nursing. It was during this time, at a Sigma Chi’s Derby Days philanthropy event, that she first met her future husband as a freshman nursing student. The pair dated for five years before tying the knot in 1986. Together, the couple has welcomed three children; daughters Nicole, popularly referred to as Nicki, and Gisela better known as Gigi. Their son Nathan is simply known as Nate. Nicki and Gigi both played Division I volleyball at Georgia Tech and Florida Gulf Coast University respectively while Nate studied at St. Brigid of Kildare School in Dublin. There are no reports of an affair by either Urban Meyer or his wife. The two have maintained a loving relationship which has been witnessed by many people in Ohio as she is always by his side during victories or losses.